An explorer-tug captain, Alex Racine spends years in space, harvesting ice asteroids for New Terran’s water-hungry outposts. His existence is both routine and solitary . . . until his ship’s computer detects a damaged alien craft drifting into system. Recognizing a once in a lifetime opportunity to make first contact, Alex pulls off a daring maneuver to latch on to the derelict. When Alex boards the Rêveur, the only entity he encounters is the ship’s AI. The entire craft is riddled with holes, damage that could only have come from a fight. While confronting the AI for answers, Alex is shocked to learn that eighteen survivors, trapped in stasis, are on board. Like the New Terrans, the Méridiens are human—both settlements originating from colony ships sent from a dying Earth—but oddly the Méridiens’ technology is hundreds of years ahead, which makes their story all the more terrifying. The Rêveur was attacked by an unknown craft, the first of its kind ever encountered. 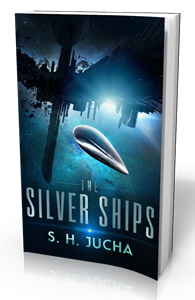 The mysterious silver ship made no contact before firing its beam weapon, and its attack was both instant and deadly. Available on Amazon in e-book and softcover editions. Available on Amazon and Audible in audiobook narrated by Grover Gardner.